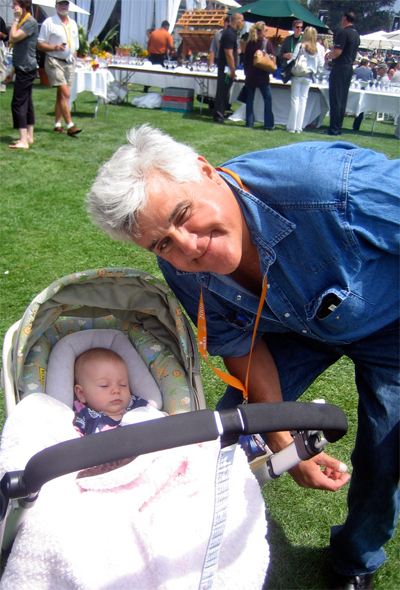 Mark, Allie and little Savannah Rose Ketcham attend the 2008 The Quail event in Carmel Valley, and showman and funnyman, Jay Leno, was there and everywhere. 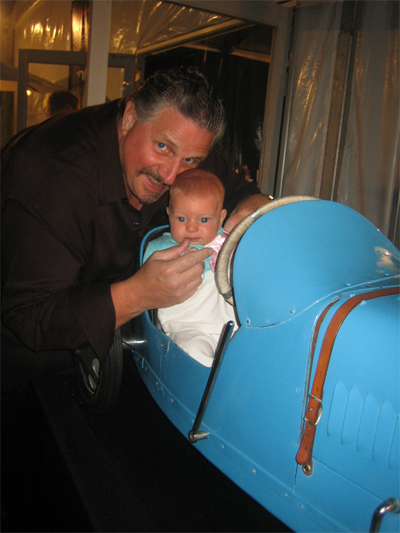 Mark & Savannah Rose Ketcham pictured at the 2008 Gooding Pebble Beach Auction, with Savannah in the "Baby Bugatti", formerly owned by great American sportsman Briggs Cunningham. The Gooding Auction sold this Baby Bugatti for over US$100,000.00 !! Goodings did some $67,000,000 in sales over the weekend and post sale, a new world record. 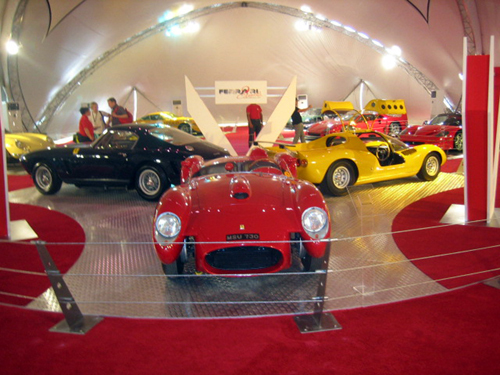 The combined five auction houses did some $140,000,000 in collectible car sales over the weekend. The market remains very strong. 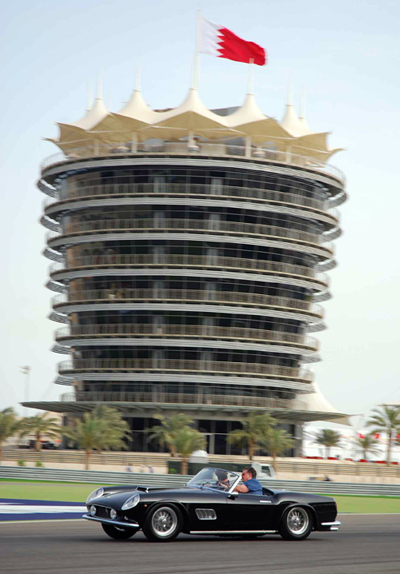 Mark Ketcham in the 1959 Ferrari California Spyder (#1501) on the Bahrain Formula 1 Track, passing the Sahkir Tower. April 2008. 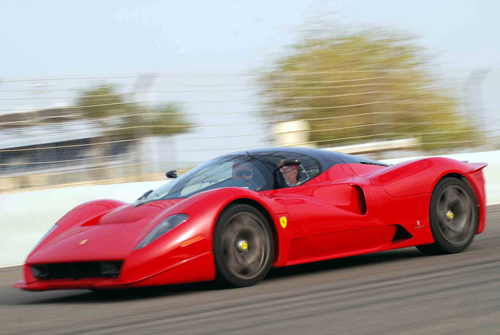 Jim Glickenhaus in his Ferrari P 4/5 Prototype (#135441) on the Bahrain Formula 1 Track. Bill Pope in his Ferrari 250 Testa Rossa (#0716) on the Bahrain Formula 1 Track. The Ferrari Pavillion (right) at the Bahrain F1 Circuit "Ferrari Classics"
Ed Davies' Mille Miglia winning Ferrari 290 MM (#0616) and Bill Pope's 1957 Ferrari Testa Rossa (#0716)- in background. 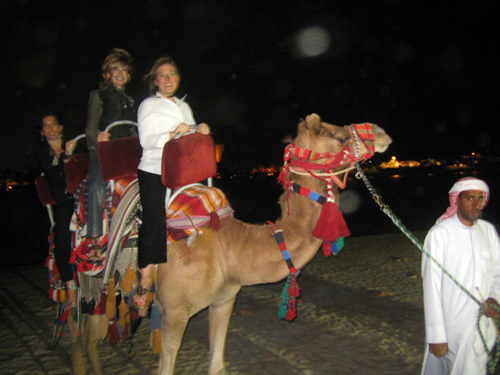 What some called the 'Party In The Dunes', saw some 20 classic Ferraris spanning over five decades of Ferrari production, come to the Kingdom of Bahrain, centered around, and in tangent with, the Bahrain Formula 1 Grand Prix. In the middle of the Formula 1 Village, a giant, purpose built white pavilion was built and flown in from Europe to house the Ferrari Classics. The Ferraris themselves came from around the world, about half from the United States and the other half from Europe and the UK. 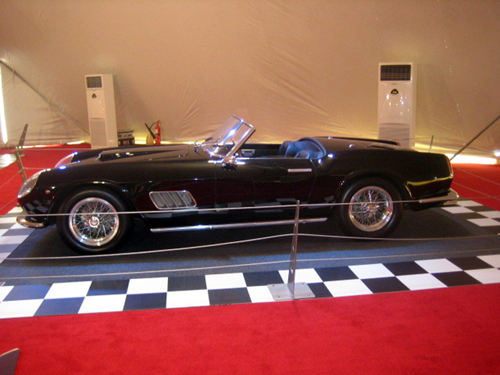 The cars were displayed in the pavilion for the Grand Prix weekend, open to all local and international patrons. Some tens of thousands of people viewed the Ferraris over the weekend, many of them viewing this caliber of Ferraris for the first time. 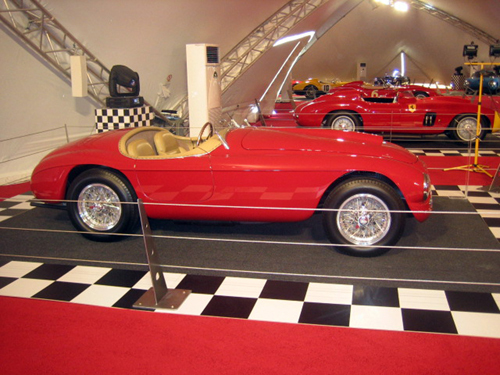 The cars were displayed chronologically around the inside of the Ferrari pavilion, with the earliest car being the 1950 Ferrari 166 MM Touring 'Barchetta' (##0054 M) brought by Lawrence & Irene Auriana. The 166 MM's, of course, were a huge part of Ferraris early history, putting them back on the racing map in the postwar. Displayed shoulder to shoulder with the 166 MM was the Mille Miglia winning 290 MM (#0616) brought by Ed Davies. Ed's 290 MM was an anchor tenant of Ferraris 1956 World Championship efforts. Certainly one of the most significant and beautiful cars built by Ferrari in the 1950's. In the two private track days for the Ferrari owners following the Grand Prix, Ed Davies proved that his car was not just for show, drifting through some of the corners the F1 drivers had been through the day before. 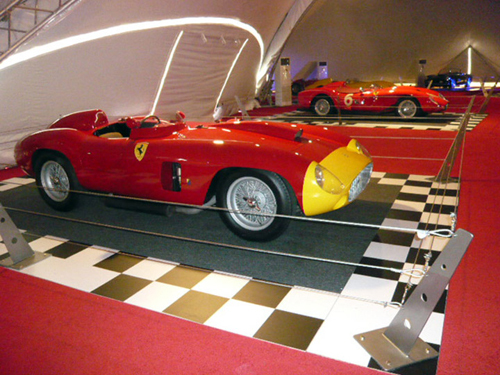 A couple of Ferraris most iconic cars came to Bahrain in the form of not one, but two, 250 Testa Rossa 'Pontoons'. The first, a 1957 Pontoon Testa Rossa (#0716) was brought by Bill Pope (USA). Not to be outdone, Bill had a blast whipping his TR around the track on the days following the GP, generously turning over the wheel to a number of the other Ferrari owners and guests. 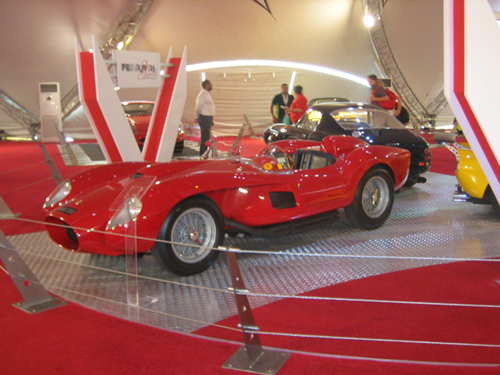 The second Pontoon Testa Rossa was a 1958 Pontoon TR (#0742) exhibited by Mark Ketcham. Six time Le Mans winner Jacky Ickx couldn't help but take a seat in the Glaesel Testa Rossa for a some laps, and was then kind enough to do numerous exhibition laps with some of the folks who were guests at the Ferrari Classic from around the Middle East. Ickx is definitely a man who knows the short way 'round a track. 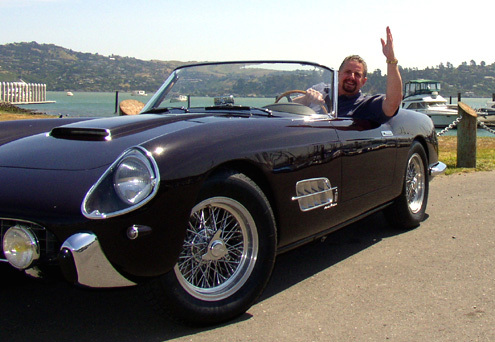 The 'Boulevardier' cars were amply represented by the 1959 LWB California Spyder (#1501) brought by Mark and Allison Ketcham. 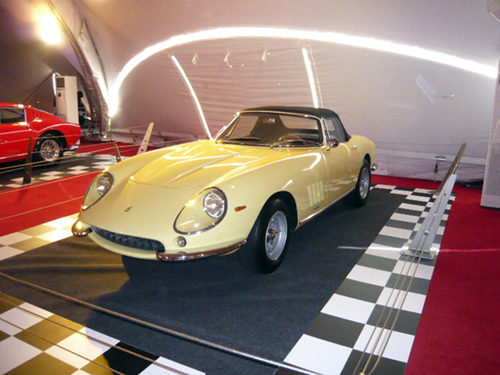 This California Spyder was formerly owned by the Hollywood actor Nicholas Cage, a wow factor to many of the patrons. Alex & Roxane Papas brought their newly acquired 1966 Ferrari 275 Alloy GTB/2 6C (#8749 GT). Rounding out the Boulevardier class, was Lawrence Auriana's 275 GTB/4 'NART Spyder', the first NART Spyder built, and one of only two alloy NART Spyders, which was also raced successfully at Sebring, and used by Steve McQueen in the movie The Thomas Crown Affair. Britain was amply represented as well, with Nick and Annette Mason bringing their 365 GTB/4 Daytona Competition Series II (#15373) which garnered good success at Le Mans and Spa in its front line racing days. As well, they brought their 512 BB/LM (#27577). Annette was seen to be smoking the tires out of the paddocks and onto the track more than once, not to be outdone by the boys, by any stretch. Their BB/LM had represented itself well at Le Mans back in the day. David Cottingham brought along his well traveled 500 TRC (#0682), and Roald Goethe did more than a few laps on the track days in his 246 Dino GP car. A special guest featured at the Ferrari Classics was the 1969 Pininfarina SIGMA, which was kindly brought out of the Museo Pininfarina by Paolo Garella, head of Pininfarina's Special Projects Department. Paolo, a former race driver and still a very able engineer, along with Jacky Ickx, drove exhibition laps for many of the the events special guests from around the Gulf and around the world. The SIGMA was a design prototype built by Pininfarina to test many new design elements for the Formula 1 cars back in period. 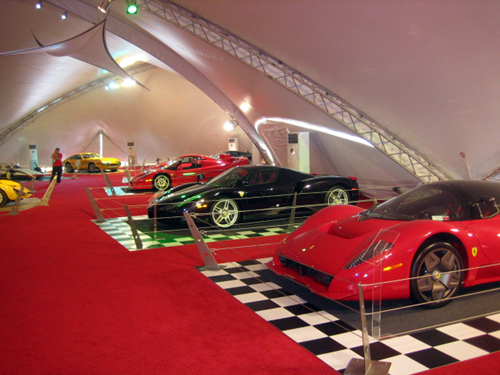 What presentation and exhibition of Ferraris would be complete without some of Ferrari's Supercars and Prototypes? The Ferrari Classic in Bahrain had a wonderful line-up with Jas and Sanjam Dhillon's 1992 Ferrari F40 (#92336), Alex & Roxane Papas' 1995 Ferrari F50 (#103921), Chris & Mary Lou Sordi's 2003 Ferrari Enzo (#133918), capped off with Jim Glickenhaus' show stopping Prototype developed in conjunction with Pininfarina known simply as the P 4/5. The crowds were five deep in front of the Supercars all weekend. The Dhillons, Pappas', Sordis and Glickenhaus were around the Pavilion much of the weekend answering questions and posing with their cars for the crowds. All the Supercars saw track time for the owners days, as well, none simply relegated to the Pavilion display. The final WOW! factor in the Pavilion was Jim Glickenhaus' newly acquired 1967 Ferrari Pininfarina Dino 206 Competizione (#10523), the very famous and much photographed yellow 'Gullwing' Pininfarina Prototype. Jim is the first owner, fresh from Museo Pininfarina. How would that be for a candidate to win the Preservation class at Pebble Beach? 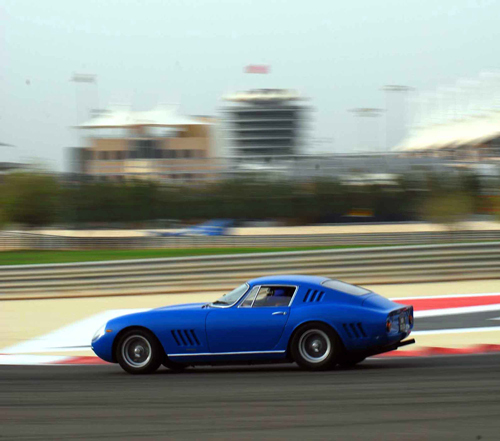 But, the Ferrari Classic was an adjunct to the main event, which was of course the Bahrain Formula 1 Grand Prix. With Ferrari taking a 1-2 podium finish, followed closely by BMW rounding out the podium, the F1 was a great show, seen by record overflow crowds all weekend. 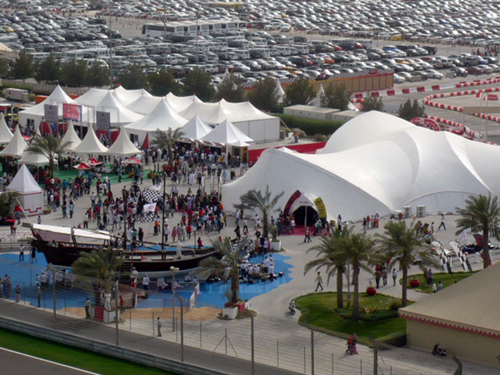 The Bahrain GP Circuit is heralded by many drivers and fans alike, as one of the finest circuits in the world. This is evidenced by the fact that there is 'no bad seat', where all seats literally have a significant view of the circuit. 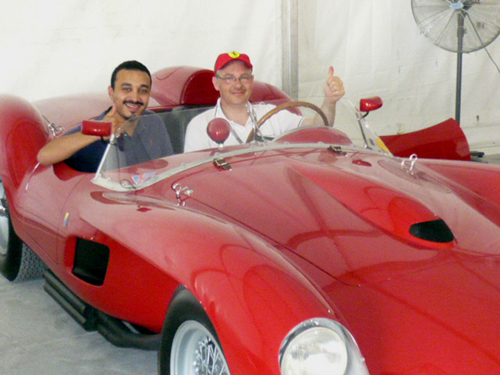 While the cars were the stars of the Ferrari Classic event, enough cannot be said about the hospitality extended to the Ferrari owners by the Bahrain International Circuit, it's staff and support people. 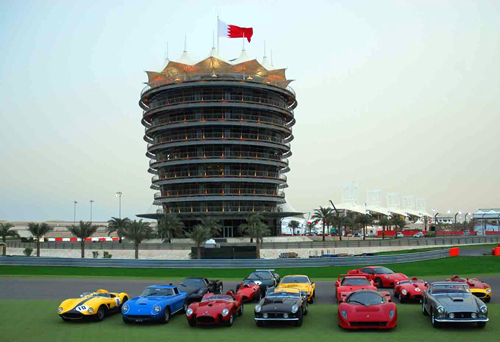 * The Bahrain Ferrari Classic was organized by the Bahrain International Circuit in conjunction with Mark Ketcham, under the patronage of the Crown Prince of Bahrain. Jay Leno dropped by and was admiring the 1957 Ferrari 250 PF Cabriolet Series I (#0737 GT) that Mark was showing with Bill Grimsley. My friend Flavio was taking so long to take the photo that Jay quipped, 'Why don't you just do a painting instead?'. Funny guy. Maybe he should go into show business. 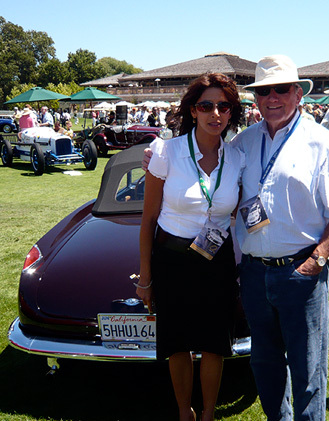 A cute admirer asks for a picture with the Cabriolet and Bill Grimsley. Bill, being the gentleman that he is, took some time for her. Cabriolet Series I (#0737 GT) will be displayed at The Quail event in Carmel Valley on Friday August 17 all day, along with 22 other Ferrari 250 Cabriolet Series I's. Come on by and say hello! It's believed to be the largest collection of Series I Cabriolets ever displayed! 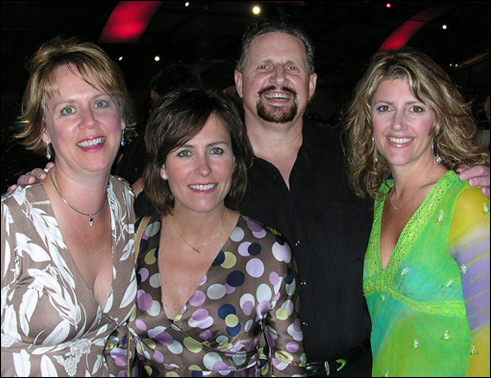 "Pebble Beach 2006- Mark & Brooke Hilton"
"Gooding Auction Pebble Beach 2006- Emily, Brooke, Mark & Jena"